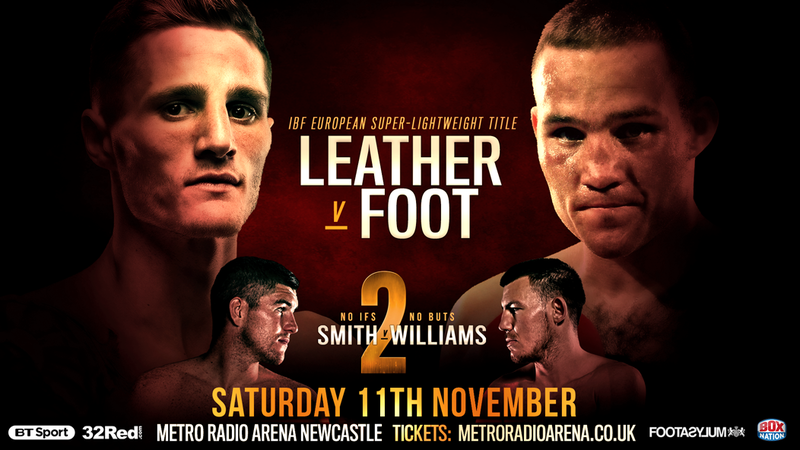 Gifted Guisborough super-lightweight Josh Leather refuses to be intimidated by Glenn Foot’s ‘hard man’ rep ahead of their north-east knuckle at Newcastle’s Metro Arena on Saturday. The Sunderland man, five years older and entering with almost double the number of pro gigs on his slate, was once convicted of assaulting a nightclub bouncer and almost had his career curtailed after his right arm was mangled in a machete attack. But 25 year old Josh, a former ABA champion, insists that class will prevail over crass when the regional rivals collide between the ropes this weekend. ‘Foot’s been shouting his mouth off a bit that I’m inexperienced and have only fought bums’ states Leather who has won 12 straight and is ranked 14th in the world by the IBF after thrashing Dublin’s Phil Sutcliffe inside six rounds last May. ‘Though we’re same weight, same region, Glenn and me have never sparred so we’ll see on fight night. I’m going to have to show him what’s what. He’s not just getting beaten, he’s getting what (Phil) Sutcliffe got, being put on his back. ‘On paper, Glenn’s probably my toughest test but I honestly don’t expect it to turn out that way. He’s quite strong and we expect he’ll steam forward and try to rough me up. But my footwork’s too good and I’m far faster and sharper. I just have to be wary of taking daft shots. The elegant but increasingly malicious 25 year old – five successive stoppage wins – has only boxed 55 pro rounds and is yet to do more than six in one hit as he heads into Saturday’s scheduled 12 rounder for the vacant IBF East/West European gong. But he is unperturbed. ‘I’ve not changed anything,’ he insists. And Leather insists he’s primed to administer another tanning when he bumps beaks with his fellow England amateur captain live on BT Sport and BoxNation this weekend. It is a quality match-up that has gripped the region; silk versus steel, exuberance versus experience. ‘There’s always a lot of rivalry between Sunderland and Middlesbrough and that’ll be intensified because Sunderland lost to the ’Boro at football at the weekend,’ says the native Teesider. ‘But fights like this are great for north-east boxing and it’s the kind of match-up that’ll take me to the next level. ‘If Glenn decides to go toe-to-toe, I’ll take him on and it’ll be painful for him. If he tries to box, I win even easier.